To construct the Oppenheim's Nikonic Sidebang you need to have the following items: a Nikon Camera; a head covered with long hair, preferably blond; a set of small, precision instruments; a supply of epoxy resin; an optivisor, or similar magnifying equipment. Each day you must pluck from your head one hundred long hairs. You must then drill a corresponding number of tiny shallow holes in the body of the NIkon camera. Into each of these holes, you must place a single hair, followed by a microscopic blob of resin glue to secure its anchorage. Over time, apart from the lens, your Nikon will acquire more and more hair until it is totally covered. It will of course remain fully useable, but you will have to carefully part the hair in order to gain access to the various controls. 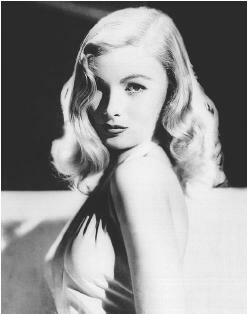 When not in use, you can style the hair and pose it in various guises, including the Sidebang, so famously characteristic of actress Veronica Lake. If you are particularly frustrated, you can also tear at it, or shave it all off, leaving your camera with a fuzzy beard. Should you decide to give up photography and surrender yourself to a religious order, your Nikon can reflect your new found beliefs by taking on a monkish Tonsure. I was expecting a radical new kind of punctuation. 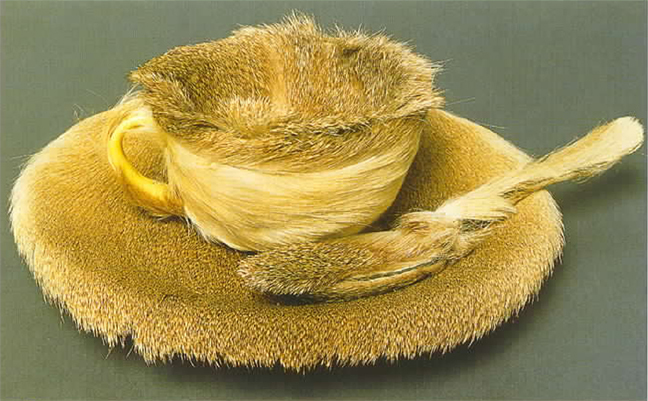 Oh, and [jutta], the Oppenheim object has very clear (and artist-admitted, I believe) sexual connotations, so with the given title, the punctuation mark would have to be furry and suggestive. And it would need to reference iconically perhaps the Greek God of athletic shoes, or whatever Nike was. This is one complex sidebang. Where will its use be appropriate I wonder? Why just Nikons? Why not Voigtlanders?